We invite you to browse Colorado's communities serviced by our team of real estate experts here at TheHomeCart.com. We hope you enjoy learning more about great Colorado cities and Denver neighborhoods. Contact us for information on any community or property. We'd be pleased to show you any home listed in the Denver Metro area. Despite a century of change, Arvada, Colorado has maintained its hometown feel by combining today’s culture with the Old West.With its quiet neighborhoods and pro-business atmosphere, Arvada has found balance in its business and cultural growth by redeveloping its downtown area while maintaining historic landmarks. View Arvada homes for sale and read more about Arvada real estate. Whether you’re looking for quiet, tree-lined streets, majestic mountain views or open prairie, you can find it in one of the more than 450 neighborhoods in Aurora, Colorado. Aurora, CO is a thriving and diverse community that offers housing and activities for any lifestyle. View Aurora homes for sale and read more about Aurora real estate. Tucked neatly into the foothills of the Rocky Mountains, just 35 miles northwest of Denver, sits Boulder, Colorado. Since its founding in 1868, as a supply town for nearby mining communities, Boulder has become one of the most progressive and visionary locales in the country. View Boulder homes for sale and read more about Boulder real estate. Broomfield, Colorado is just 20 minutes from Denver, 10 minutes from Boulder and is one of the fastest growing areas in the country. Its proximity to some of the nation’s top technology companies, located along the “technology corridor” on U.S. Highway 36 attract professionals looking for a quick commute. View Broomfield homes for sale and read more about Broomfield real estate. Allow us to present Castle Pines Village, Colorado. A luxuriously planned gated golf community nestled in the rolling hills, north of historic Castle Rock, in Douglas County, Colorado. This upscale suburb offers majestic views, and a feel for elegance reserved for a discerning few. Castle Pines Colorado presents custom homes on spacious sites surrounded by spectacular Ponderosa Pines set in a pallet of natural wildflowers. View Castle Pines homes for sale and read more about Castle Pines real estate. Castle Rock, Colorado is a prime location for those seeking a rural residential setting with relatively easy access to major employment centers. Situated 30 miles south of downtown Denver and 35 miles north of Colorado Springs, with its clean environment, natural beauty of the Colorado foothills and its convenience to a wide range of recreational amenities, this town is an attractive residential community. View Castle Rock homes for sale and read more about Castle Rock real estate. Denver’s newest city, Centennial, Colorado spans across Arapahoe County from Aurora to Littleton. Incorporated in 2001, Centennial is home to the Southglenn Mall, which offers a variety of shops, boutiques and restaurants. Given Centennial’s location, it also provides easy access to the Denver Technological Center (DTC) and major transportation arteries. View Centennial homes for sale and read more about Centennial real estate. Welcome to Cherry Hills Village, one of Denver’s most prestigious communities. This private community is filled with neighborhoods of charming homes with an average price of $2 million. The large residential lots accommodate luxurious single-family homes and estate properties. View Cherry Hills Village homes for sale and read more about Cherry Hills Village real estate. Named for the state flower, Columbine, Colorado is a small stable community, located in the southwest portion of the greater Denver metropolitan area. Residents and visitors alike enjoy huge open spaces, and recreational waterways along the Platte River, as well as close-in shopping along Wadsworth Boulevard. View Columbine Valley homes for sale and read more about Columbine Valley real estate. Located in Adams Country, as one Denver’s northern suburbs, Commerce City, Colorado has been a center of agriculture since its beginnings, and in the early part of the last century, was often refered to as Denver’s “bread basket”. View Commerce City homes for sale and read more about Commerce City real estate. Sitting at 5,280 feet (one mile), centrally located where the eastern plains end and the Rocky Mountains begin, is Denver, Colorado. Old, yet modern, Denver is a city rich with diversity. Downtown, historic buildings coexist with modern architecture while, on the eastern plains, tumbleweeds accompany a modernistic international airport. It is also home to professional sports including football, basketball, baseball, hockey, soccer and lacrosse. View Denver homes for sale and read more about Denver real estate. Nestled at the northern end of the Black Forest in Colorado’s high prairie, Elizabeth, Colorado is well known for extraordinary horse properties, and panoramic views of the Rocky Mountains. Elizabeth grows each year as more Coloradoans seek the employment opportunities of a large city but prefer the ambience of a small town. View Elizabeth homes for sale and read more about Elizabeth real estate. Englewood, Colorado is just 20 minutes south of downtown Denver. It offers small town convenience with big city amenities. Residents and businesses alike benefit from major transportation corridors and a central location. View Englewood homes for sale and read more about Englewood real estate. “Close-in country living,” best describes Foxfield Colorado. Located in the Southeast portion of the Denver Metro area, in Arapahoe County, and with spectacular Rocky Mountain views, home sites in Foxfield, Colorado are required to rest on at least 2 full acres, which gives this small rural community a distinct country feel. Homes are custom built, with agricultural diversity and pride of ownership standard. View Foxfield homes for sale and read more about Foxfield real estate. Golden, Colorado is a picturesque town nestled at the base of the foothills only 15 miles from downtown Denver. Stroll through its historic downtown and enjoy the unique shops, variety of restaurants or visit other attractions including Boettcher mansion, Heritage Square, the Buffalo Bill Museum or take a tour of Coors, the largest single brewery in the nation. View Golden homes for sale and read more about Golden real estate. Located on the south side of metro Denver, Greenwood Village, Colorado is known for its excellent facilities, public services and real estate options.Greenwood Village is home to The Denver Technological Center (DTC) where hundreds of businesses are located. Some well-known employers include U.S. West, Great Western Life and Microsoft, to name a few. View Greenwood Village homes for sale and read more about Greenwood Village real estate. Located on the southern edge of the Denver Metro area, along C-470 and approximately 1 mile west of I-25, you will find Highlands Ranch, Colorado. The area is 24 years old and continues to be one of the most successfully planned communities in the nation with sustained, managed growth. View Highlands Ranch homes for sale and read more about Highlands Ranch real estate. Lafayette, Colorado’s panoramic view of the Rocky Mountains inspires its vision for the future. A mix of small town livability, balanced growth, and superior city services defines this inspired community. Home to approximately 24,000, and located in the rolling hills of the Colorado front range 10 miles east of Boulder, residents of Lafayette, Colorado enjoy well-kept neighborhoods along tree-lined streets, a vibrant economy, and active lifestyles. View Lafayette homes for sale and read more about Lafayette real estate. 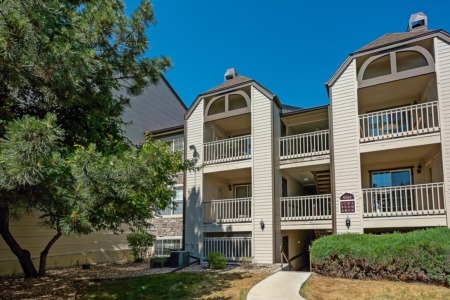 Lakewood, Colorado seems to have the best of both worlds…some of the best views of the Rocky Mountain foothills on one side and the vitality of downtown Denver just minutes away. This vibrant community is mainly residential with housing choices from brand new to older. Many neighborhoods have views of the mountains or the city lights. View Laketwood homes for sale and read more about Lakewood real estate. Littleton, Colorado covers much of the south metro Denver area offering a small town atmosphere with the benefits of a large city. The Downtown Littleton area has wonderful shops and restaurants for every taste and is known for its beautifully restored turn-of-the century buildings. View Littleton homes for sale and read more about Littleton real estate. Located less than twenty miles south of downtown Denver, Lone Tree, Colorado is near the big city amenities yet it is far removed from the big city congestion. Lone Tree offers an abundance of outdoor recreation. Sweet Water Park is enjoyed year-round and a vast network of hiking and walking trails inspire residents to take advantage of amazing experiences waiting at their doorstep. View Lone Tree homes for sale and read more about Lone Tree real estate. A rich heritage of strong values and honored traditions form the basis of life in Louisville, Colorado. This suburban residential community, located in Boulder County, blends a hometown atmosphere with a progressive outlook, that fosters the advance of business, cultural and civic welfare. View Louisville homes for sale and read more about Louisville real estate. Located in beautiful Bear Creek Canyon, in Jefferson County Colorado, and just 30 minutes from downtown Denver, folks in Morrison Colorado like to refer to the town as "The Nearest Faraway Place”. Despite its proximity to Denver, Morrison's relative seclusion provides separation from its metropolitan neighbors, and offers the feel of a remote mountain town. View Morrison homes for sale and read more about Morrison real estate. Located seven miles north of Denver, in western Adams County, Northglenn Colorado is a planned community, featuring new homes, and more than 30 miles of well planned greenway trails and parks, that form a community residents are proud to call home. View Northglenn homes for sale and read more about Northglenn real estate. If you’re looking for “elbow room”, Parker, Colorado is the place for you. With rolling hills, pastures, stables, arenas and barns, the area has held onto its equestrian roots. Five-acre plotted communities on the prairie offer horse lovers what they want. View Parker homes for sale and read more about Parker real estate. If you’re traveling south of Denver, on U.S. 85 toward Castle Rock, and perhaps looking to find adventure in Pike National Forest, you’ll have to pass through Sedalia, Colorado to get there. Despite the aggressive development taking place on all sides of Sedalia, residents still live in a rural setting, some on small lots, others on spacious wooded acreage with spectacular views of the Front Range. View Sedalia homes for sale and read more about Sedalia real estate. A community with a strong commitment to quality of life and environmental issues, probably best describes Thornton, Colorado. Just 10 miles north of Denver, Thornton’s location provides an ideal environment for business, recreation and residences. View Thornton homes for sale and read more about Thornton real estate. Situated halfway between Denver and Boulder, Westminster, Colorado has become a great alternative for anyone employed in Denver’s center of finance and government, and Boulder’s center of research and education. Westminster is a mix of old and new, from carefully preserved history at the Bowles House Museum, among others, to the Butterfly Pavilion (at the Promenade). View Westminster homes for sale and read more about Westminster real estate. Interstate-70, as it curves west, into the heart of the Rocky Mountains, cradles a small progressive city of 30,000, named Wheat Ridge, Colorado. Antique shops and consignment stores line the streets alongside an eclectic mix of up-scale boutiques and restaurants in this diverse community, set in the history of pioneers who came before. View Wheat Ridge homes for sale and read more about Wheat Ridge real estate. Situated along a scenic curve in the South Platte River, about 30 miles southwest of Denver, Bailey, Colorado enjoys the distinction of being one of the largest and most popular communities in the Platte Canyon, and it’s no wonder. Classic alpine scenery lends a particular charm to this progressive mountain town. View Bailey homes for sale and read more about Bailey CO. Bow Mar developed as an agricultural area, as greater Denver began to grow, in the late 19th century. It became home to several large farms that provided for both Denver and Littleton. As Denver continued to grow in the post-World War II era, Bow Mar farmland was purchased to develop single family housing, and many of the homes came out of the Frank Lloyd Wright prairie-style school of architecture. View Bow Mar homes for sale and read more about Bow Mar CO. The fastest growing region in Colorado is about 20 minutes northeast of downtown Denver on the banks of the South Platte River. Founded in the 1870’s as a stage and railroad depot and farming community, this is home to residents of Brighton, Colorado. View Brighton homes for sale and read more about Brighton CO. Settled in the foothills where the say “the great plains meets the Rockies”, 35 miles southwest of downtown Denver, Conifer Colorado is an unincorporated community in Jefferson Country, with a population of about 75,000. View Conifer homes for sale and read more about Conifer CO. The Denver Technological Center (DTC) was established in 1962. Back then, development of an “office park,” 20 minutes east of downtown Denver was a rather novel idea. But the idea was simple: establish a true a first-rate environment, where people could both live, and work for years to come. View Denver Tech Center homes for sale and read more about Denver Tech Center. The city of Edgewater, Colorado is at the center of a checkerboard of small growing communities located west of the Denver metropolitan area. As a result, residents of Edgewater enjoy a spectacular view of the Denver Skyline, and easy access to major thoroughfares, including I-25, I-70, and 6th Avenue. View Edgewater homes for sale and read more about Edgewater. An easy commute off Interstate-70, and only 35 minutes from downtown Denver, Evergreen Colorado is a place where purchasing a quality home, supporting quality schools and paying taxes for quality government, often costs less than in many metropolitan areas on either coast. But that’s only part of the story. View Evergreen homes for sale and read more about Evergreen. Back in the mid 1930s a handful of residents in Federal Heights, Colorado were forced to rely on only a small well, to provide water for their growing community. But times change, and water problems get solved. View Federal Heights homes for sale and read more about Federal Heights. Glendale, Colorado is a very small, very dense community of about 5000 residents, 3 miles from the center of, and completely surrounded by, the city of Denver. View Glendale homes for sale and read more about Glendale. Henderson Colorado is situated in an unincorporated portion of Adams County, in the Denver-Aurora metropolitan area. Henderson was originally home to a small trading post, and hotel that sold provisions to miners on their way up the South Platte River Trail, to the gold fields, during the Colorado Gold Rush of 1859. View Henderson homes for sale and read more about Henderson. Idledale, Colorado sits as a small un-incorporated town in Jefferson County Colorado, just west of Denver, in beautiful Bear Creek Canyon. You couldn’t find more than a handful of settlers in this part of the state, back when the stage line ran through the canyon in the late 1800’s, and perhaps fittingly, not a lot has changed. View Idledale homes for sale and read more about Idledale. Indian Hills is a beautiful mountain suburb just outside Denver, in Jefferson County, Colorado. The ponderosa pine forests and flowered meadows that surround this small close-knit community of 1500, reach elevations above 8000 feet. View Indian Hills homes for sale and read more about Indian Hills. Southwest of Denver, in Jefferson County between Morrison and Evergreen, in the heart of Bear Creek Canyon, we find Kittredge Colorado. Former U.S. Senator Gary Hart proudly calls Kittredge, Colorado home. View Kittredge homes for sale and read more about Kittredge. 25 miles northeast of Downtown Denver on the edge of the eastern Colorado plains, in Weld County, a small town atmosphere with a growing population awaits: Lochbuie, Colorado. View Lochbuie homes for sale and read more about Lochbuie. It’s hard to describe Louviers, Colorado as anything other than a quaint village, located in Douglas County, 25 miles southeast of the Denver metropolitan area. View Louviers homes for sale and read more about Louviers. The first town meeting in Monument, Colorado was held July 3, 1879. The area’s first settlers started out from Iowa, wagon trains in tow, headed toward California, and the gold rush. But when they arrived in the Monument area, and saw the tall meadow grasses, fresh spring waters, and rich farming soil, they decided the gold could wait. View Monument homes for sale and read more about Monument. The word “picturesque” may just be a little overworked when describing Colorado mountain communities, but visit the town of Pine, Colorado, nestled in the foothills southwest of the Denver Metropolitan area and really, no other word comes to mind. View Pine homes for sale and read more about Pine. Sheridan, Colorado began with the establishment of a U.S. Army post in 1887, and grew in tandem with the expansion of the Southern Pacific and Rio Grande railroad facilities thriving in the area, at that time. View Sheridan homes for sale and read more about Sheridan. The history of Superior Colorado lies in the coal mining industry, and it’s said the town itself was named after the "superior" quality of coal found in the area. View Superior homes for sale and read more about Superior. Watkins Colorado, 25 miles east of Denver is an unincorporated town in Adams County Colorado, and it seems they prefer it that way. In an effort to avoid annexation by the City of Aurora, Colorado, which surrounds Watkins on three sides, the town incorporated briefly in 2004, then voted to dissolve the action 2 years later. Not exactly something you’d get from a political novice. View Watkins homes for sale and read more about Watkins.